This article was first published in the summer 2011 edition of This England Magazine and it is published again here for a wider readership. So I ask you to accompany me with my collection of Cornish memories. I was born in Torpoint in Cornwall in 1929 and my wife, Pam, and I have been collecting old picture postcards for many years. I have written and compiled old photograph books about Cornwall using our collection, and now show some of our best old photographs to a wider audience. Many people have been going to Cornwall on holiday for years, so I have chosen eight of our best views of places in Cornwall in the 1930s, 1940s and 1950s to remind you of those days. I have added some information with each picture and mentioned a few places that you might like to visit in the future. I do hope that this nostalgic journey reminds you of your times in Cornwall long ago. 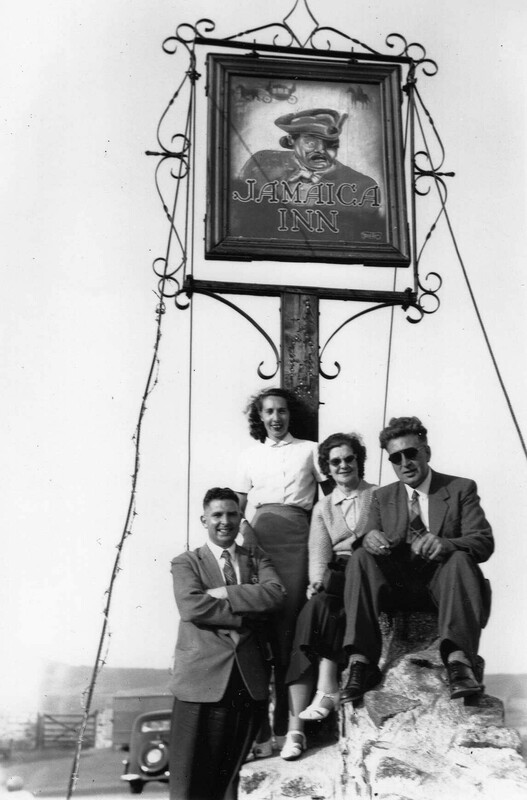 By way of an introduction, View No 1 (below) shows Pam and me, with my Mum and Dad, at Jamaica Inn on the A30 road on Bodmin Moor, in 1956. We were on a charabanc trip to Jamaica Inn and Dozmary Pool and I handed my old camera to someone to take this picture. The fierce smuggler glares down with his one eye and Dad looks the part in his tie, with a cigarette and dark glasses. Mum and Pam came out very well, and I just grin and fold my arms. 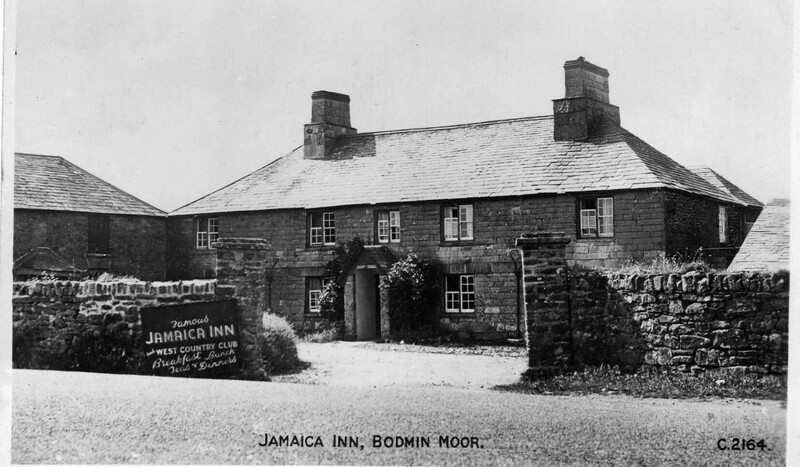 View No 2 was taken by the well-known local photographer, George W.F.Ellis, and shows Jamaica Inn in about 1940. This is the famous slate-hung eighteenth century smugglers inn which inspired Daphne du Maurier’s novel. Today, the A30 just by-passes the Inn and you need to spot it in the distance and turn off to it for refreshment. View No 3 is of St Mawes in Roseland at the mouth of the Fal River with the St Mawes to Falmouth Ferry c. 1950. This picture was also taken by George W.F.Ellis and nothing is posed, yet he has caught the moment. The skipper comes out of his wheelhouse, the gangplank has gone, and some passengers are moving about as they set off on their 25 minute journey across Carrick Roads to the Prince of Wales Pier at Falmouth. They are going to enjoy spectacular views of the Fal and see boats of all types on the river. St Mawes Harbour is in the background with the Ship & Castle Hotel very prominent with its balcony and lounge bar overlooking the water. There is an interesting old car on the quay and the pleasure-boats are ready for trips up the river when the tide is high. 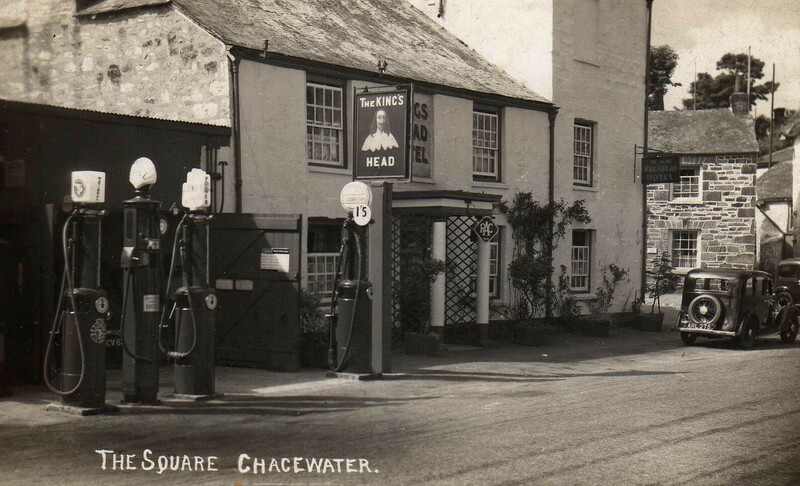 View No 4 is The Square in Chacewater c. 1942. This fine picture states everything about cars and driving many years ago. Our first car was a shiny black 1938 Morris 8 Series E and it would fit into this picture perfectly. Note how those lovely, artistic, hand-operated petrol pumps stand threateningly in a row! This was George Potter’s Garage alongside the King’s Head Hotel in Chacewater on the A3047 road, and it is fascinating and very nostalgic. It evokes memories of a better motoring world when petrol was 1 shilling and 5 pence a gallon!! Looking at the garage you can see Mr Potter’s car peeping out between the pumps. Its registration number starts CV6 so maybe it was new in 1937/38. The car outside the hotel (ARL275) was new in about 1934. The Petrol Station was a “Free House” it seems with National, Shell, Power and Esso petrol on sale. It must have been difficult competing with the bigger and cheaper petrol stations, and the garage closed in the 1970s. It has now completely disappeared but the Kings Head Hotel is still there. It has had some changes to the facade: a different porch and the building has been pebble-dashed. There are also bay-windows each side of the doorway now, and a rather less benign portrait of Charles I hangs outside. View No 5 shows Nancegollan Post Office in 1938. This is another telling picture. Today it is a very smart private house on the edge of the village. Then, it was a post office in a small village serving the community in many ways. 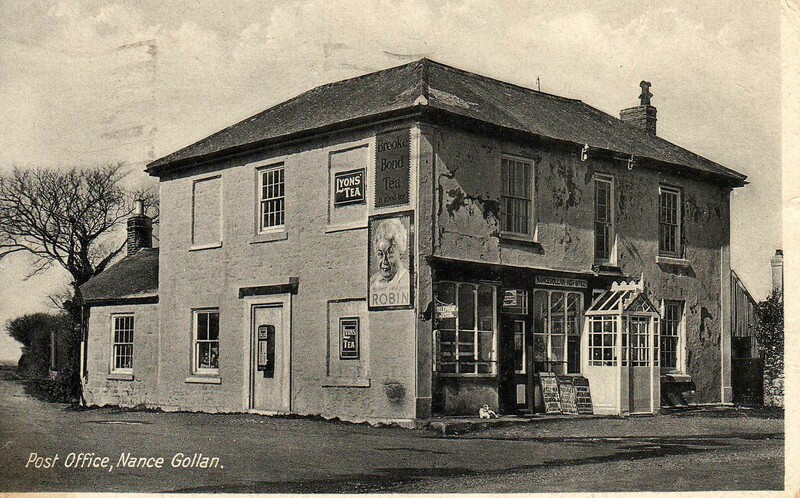 It was full of character: it was a shop and a post office and there was a porch and signs everywhere on the walls: Robin Starch, Lyons Tea, Gold Flake Tobacco, and Broke Bond Tea. They sold newspapers too, and there was a stamp machine and chocolate machine on the walls, and a telephone inside. The house does need a bit of decorating though, so I suppose there never was much profit in running such a business despite the long hours and hard work. Now it’s gone like hundreds of others. The government gives away millions on undeserving causes but cannot keep our post offices open even though they are often a life-line for the old and infirm. 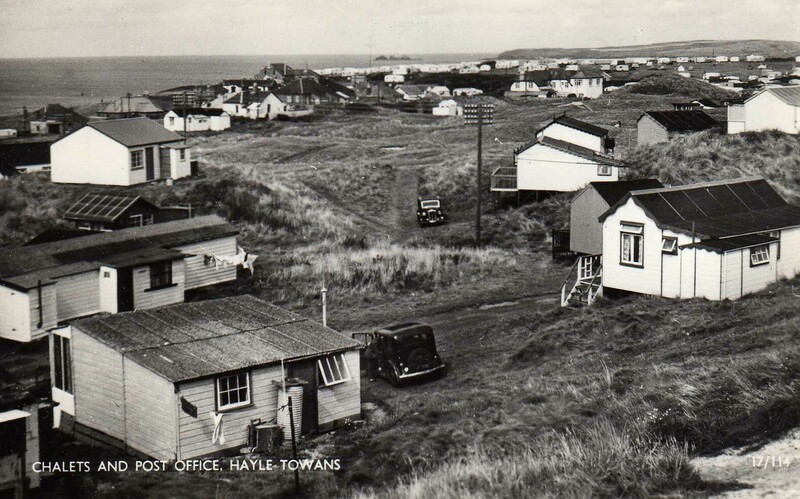 View No 6 is of Gwithian Beach c. 1930, and View No 7 shows Hayle Towans, c. 1938. Gwithian Beach and Hayle Towans are adjoining beaches in beautiful St Ives Bay. 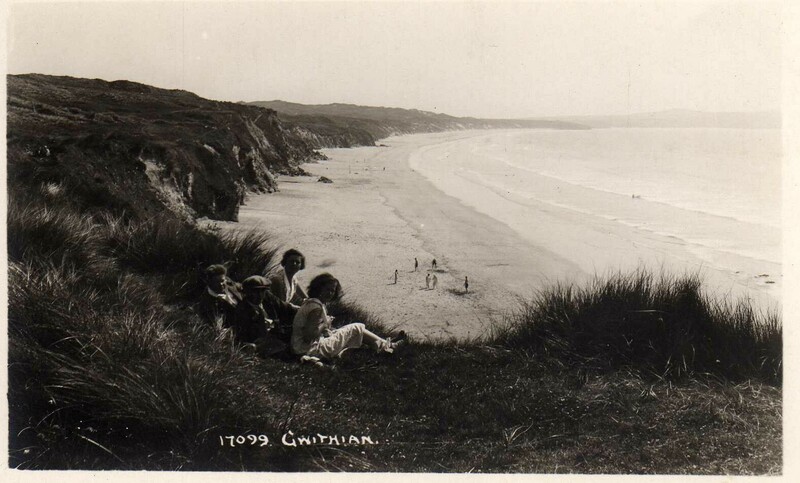 The Gwithian Beach photograph was taken by Mr A.H.Hawke of Helston who was one of Cornwall’s most highly-rated photographers. Here he arrives to find two courting couples on the cliffs and has included them in his view of the beach looking west. There are miles of fine sands here, and out of sight further along on the left are the Hayle Towans, where there are holiday chalets built among the sand-dunes. See the old-fashioned black cars parked alongside the chalets. You can still become a “beach-bum” here throughout the summer. In the top right-hand corner of the Hayle Towans photograph you can see Godrevy Point and Godrevy Island. There is a National Trust car-park on Godrevy Point now, which is a great spot for a day out with the family. 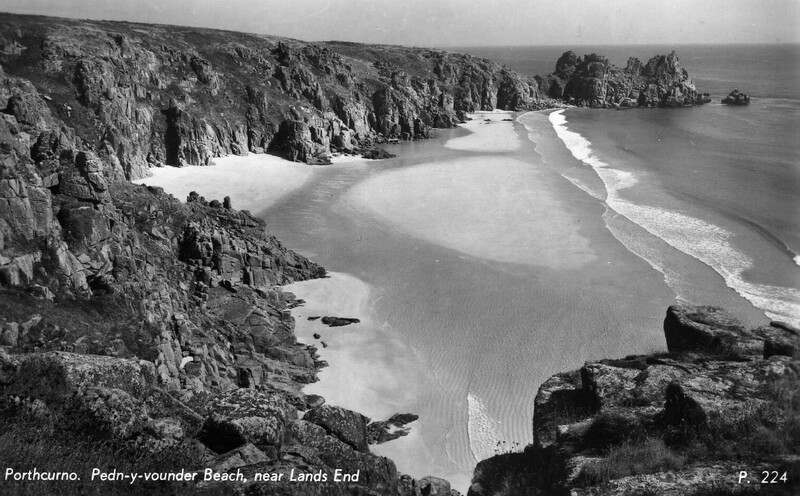 View No 8 is Pednvounder Beach and The Logan Rock c.1950. I end with my favorite view in Cornwall. Drive along the B3315 road from Newlyn, or the B3283 road from Penzance and turn off at the little hamlet of Treen. Park the car in Treen car-park and walk across a broccoli field or down a lane to the coast and this is the view looking east. It is beautiful Pednvounder Beach with the massive granite headland in the distance known as Treryn Dinas the site of an iron-age cliff castle. I suggest you combine this visit with a look at Porthcurno, Lamorna Cove and St Levan. I should mention that Pednvounder is a naturist beach so if you want to take your clothes off – that’s OK too. That is all for now and I hope you enjoyed my memories of Cornwall.